The efficient way to recover wort from hot trub in the Whirlpool. Increase brewing yield with wort recovery from the whirlpool, while maintain or even improve wort quality reducing energy and water consumption using the Intelligent Whirlpool System (IWS). The Alfa Laval Intelligent Whirlpool System (IWS) works with our Foodec decanter centrifuges to deliver unparalleled efficiency. A shorter whirlpool time improving wort quality, while increasing operation speed. IWS enables higher hop utilization by separating residual solids in the decanter. It minimizes fouling and clogging in the wort cooler and reduces trub amount in the fermentation. IWS is suitable for brew sizes larger than 50 hl (43 bbl). 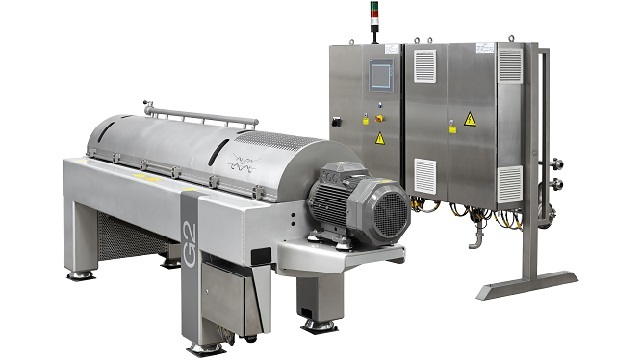 Alfa Laval optimized IWS scope of supply, with fully automated, predesigned compact modular decanter solution, with gradual equipment sizing, is providing optimal customer investment cost, with fast and easy start-up and operation. By introducing Alfa Laval Intelligent Whirlpool System (IWS), Alfa Laval is adding decanter loop to existing whirlpool. Decanter loop is working in parallel with whirlpool process. Whirlpool process is not changed. whirlpool should efficiently sediment all trub and hops solids in the bottom, still. Decanter loop is added to remove all the solids from the whirlpool during whirlpool process. Solids from the cone in the whirlpool bottom are pumped to Alfa Laval Foodec decanter. Decanter is separating clear wort from the trub solids. Clear wort returns back to the whirlpool or downstream to the wort cooler line, before whirlpool is completely empty. Solids trub and hops efficiently separated from decanter are removed from the process. They are transported to spent grains and sold together as animal feed. As all solids are pumped from whirlpool to the decanter before whirlpool is emptied completely, there are no remaining solids in the bottom of the whirlpool. In contrary, whirlpool is clean of solids. There is no need to flush trub solids from the whirlpool after the process, using additional water and time. As all solids sedimented to the bottom of the whirlpool are immediately pumped from the whirlpool to decanter and they are no solids in the whirlpool bottom towards emptied whirlpool, trub carry over at the end of emptying is reduced and there is no need to slow down the whirlpool emptying at its end. This shorten total whirlpool time as well.